Our family’s Thanksgiving traditions are long-standing—tons of great food for lunch, followed by football (playing and watching), cards, then we kind of just snack and eat leftovers for dinner. There’s a veggie platter, plenty of desserts, crackers, chips, and there’s always a cheeseball. The kind my family makes is generally savory, with pimentos and covered in nuts. But this recipe I found on Pinterest intrigued me with its combination of sweet and savory, so I decided to whip it up for Thanksgiving. Funny enough, we were all so full that we didn’t even get it out on Thanksgiving, but we devoured it a couple days later and it got rave reviews from my family. Even better, the cranberries were a great Thanksgiving tie-in! 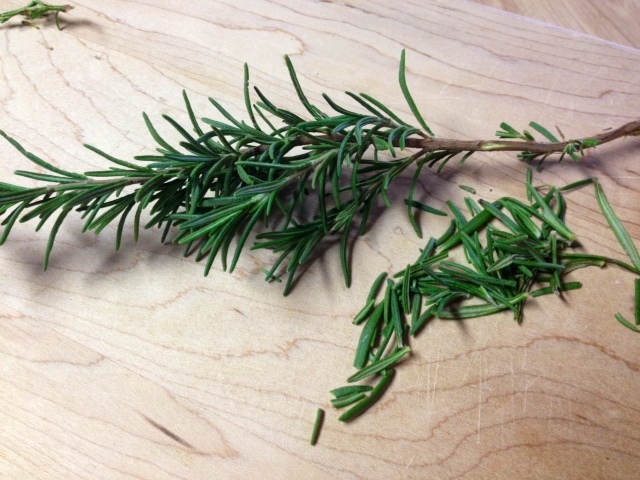 Even that late in November, my mom had this giant rosemary bush in her garden. 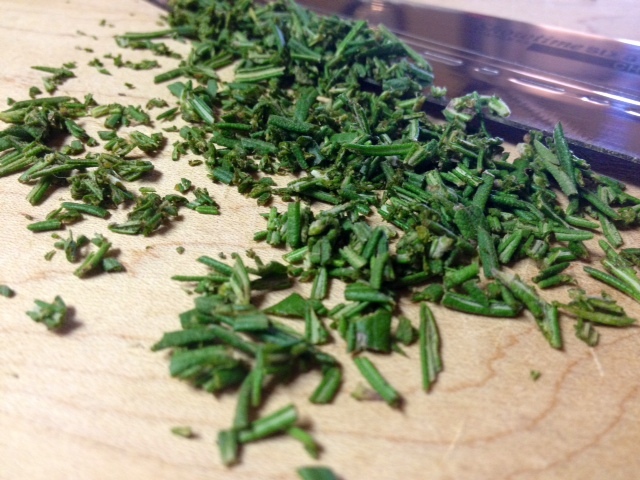 So we had tons of fresh rosemary to use. Chop up the rosemary really fine. 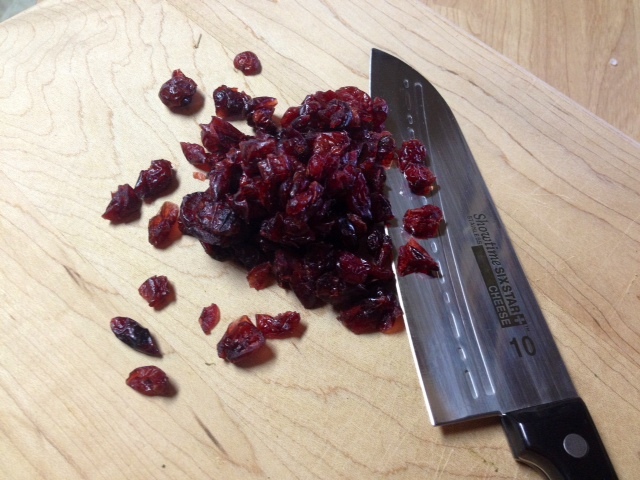 Take the dried cranberries and just kind of roughly chop them up. 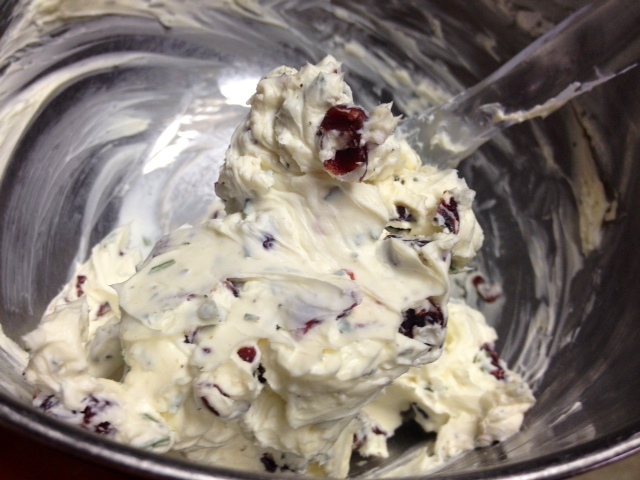 Put the softened cream cheese, cranberries, rosemary, garlic powder, salt, and pepper in a large bowl. Stir everything together, and season additionally as needed. I definitely needed to add some more of the garlic powder, salt, and pepper to make it a little more flavorful. Taste it by itself and on a cracker (or however you’ll be serving it) to check. 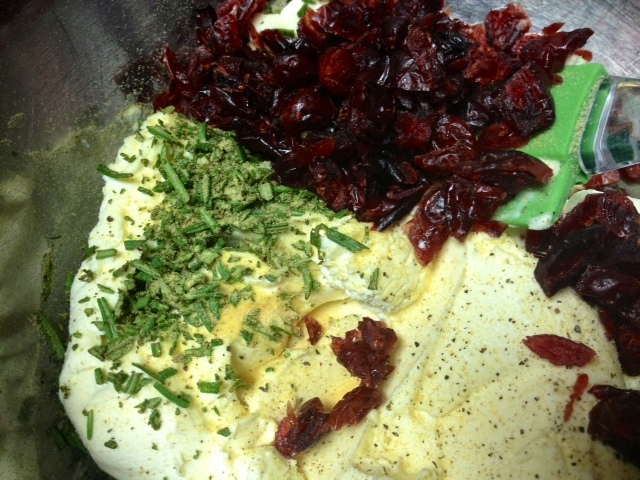 When it’s ready, the easiest way to store and chill is to lay out some plastic wrap and dip the cheese mixture onto it. Wrap up the cheese into a ball using the plastic wrap, trying to get any air bubbles out. Chill until ready to eat, at least a couple hours. 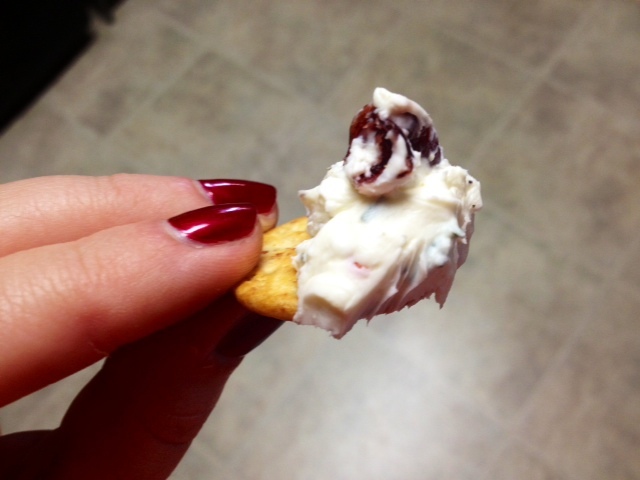 Place cream cheese in a bowl and, using a spoon, fold in all ingredients until well combined. Chill for at least two hours. Serve along side crackers or toasted baguette slices.